SERVPRO is here to help with any size water loss in your area. If you have any questions, you can call us 24/7 at (770) 945-5355. Our team is always available to help answer your questions. 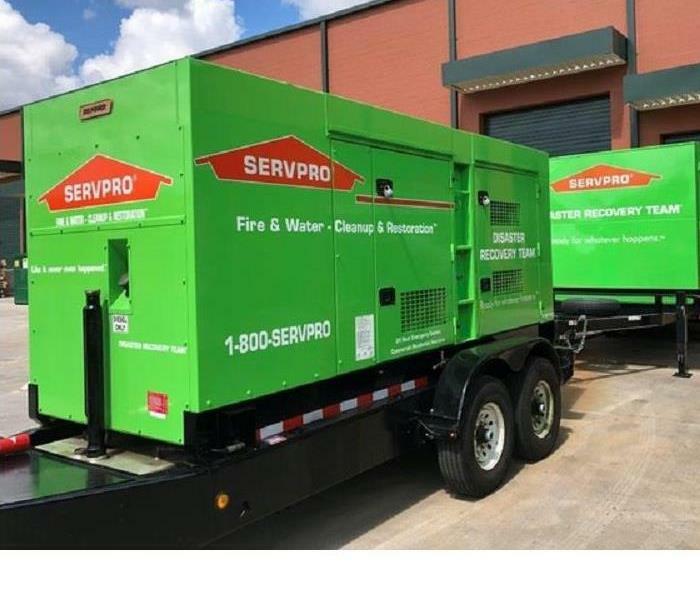 SERVPRO in Buford can handle any size commercial water loss. Our team is quick to respond and remove water from any size property. If you have any questions, do not hesitate to contact us at (770) 945-5355. 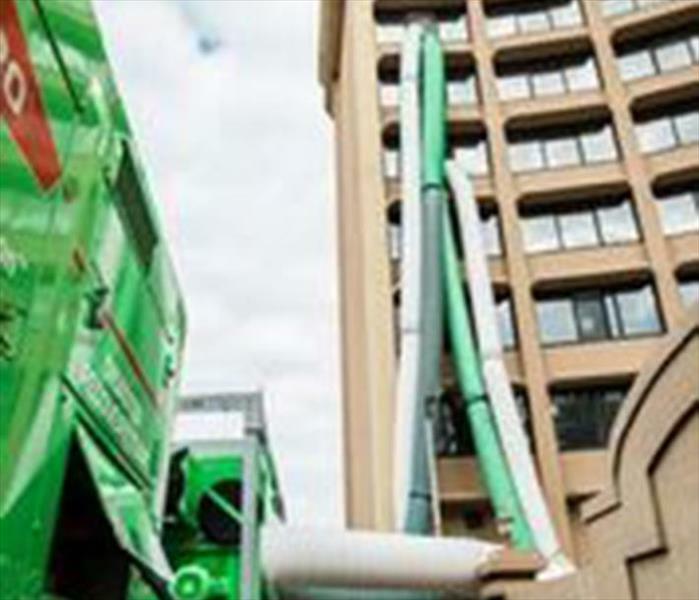 SERVPRO is here to help with any size water loss your business might have. Our team is quick to respond to begin mitigating damages. We have the commercial equipment to handle any size water loss in your area. SERVPRO is able to handle any size water loss in the Buford area. Our team has over 40 years of experience in the restoration industry. If you have any questions, do not hesitate to contact us at (770) 945-5355. 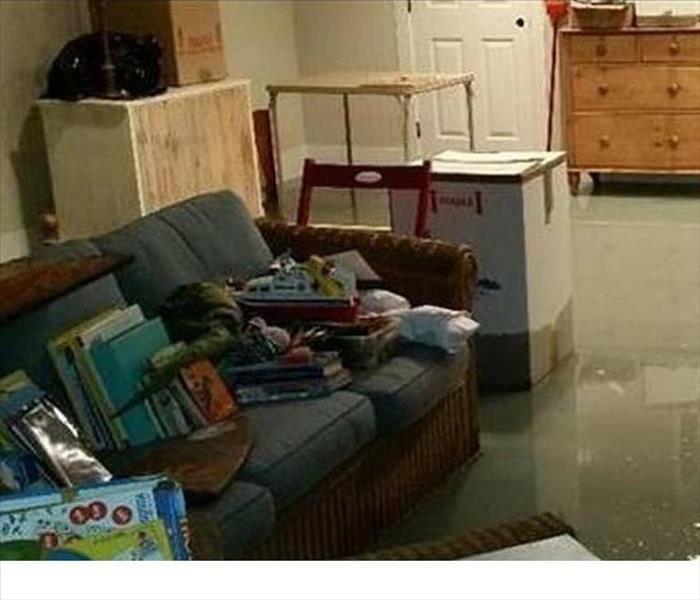 SERVPRO can handle any size water loss in the Buford area. Our team is quick to respond and has the necessary equipment to dry any size project. If you have any questions, feel free to contact us at anytime by calling (770) 945-5355. 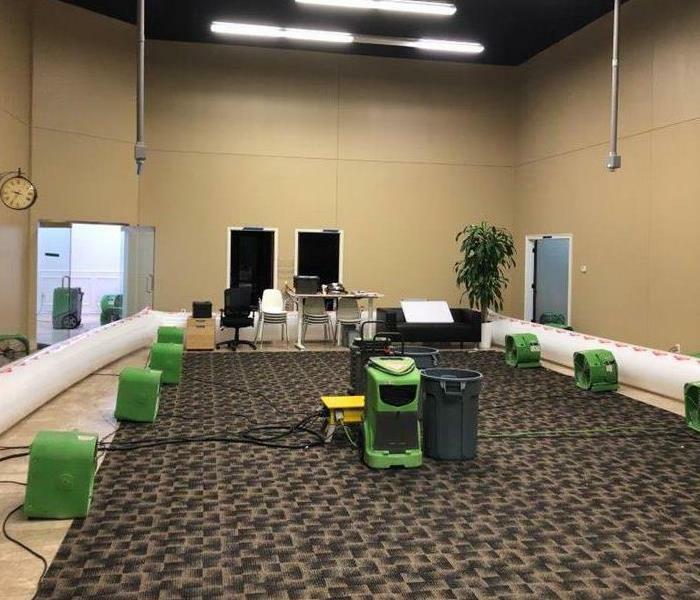 When working a large water loss like this commercial facility experienced, we will often use commercial desiccant dehumidifiers in conjunction with other drying equipment to help speed up the drying process. If you have a large loss in the area, call us! 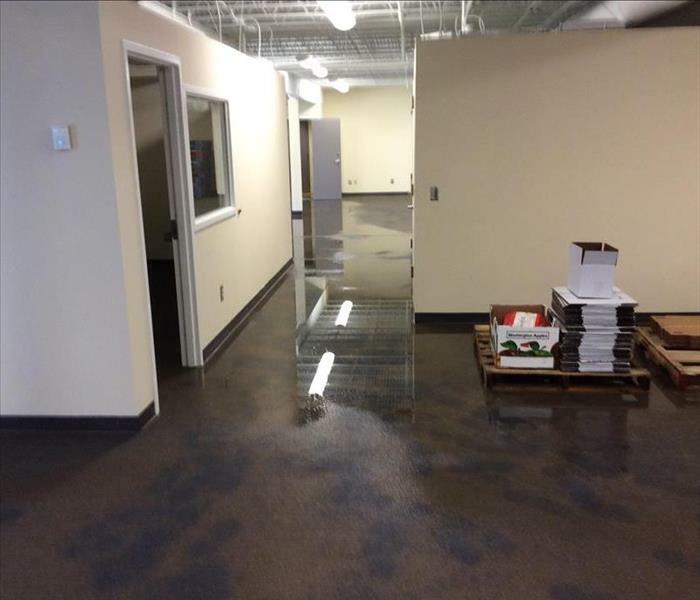 Our team worked hard to clean up this facility in Suwanee after it suffered damage from a large water loss. We are always prepared for disasters, no matter how big. If you have a loss in your business, give us a call. 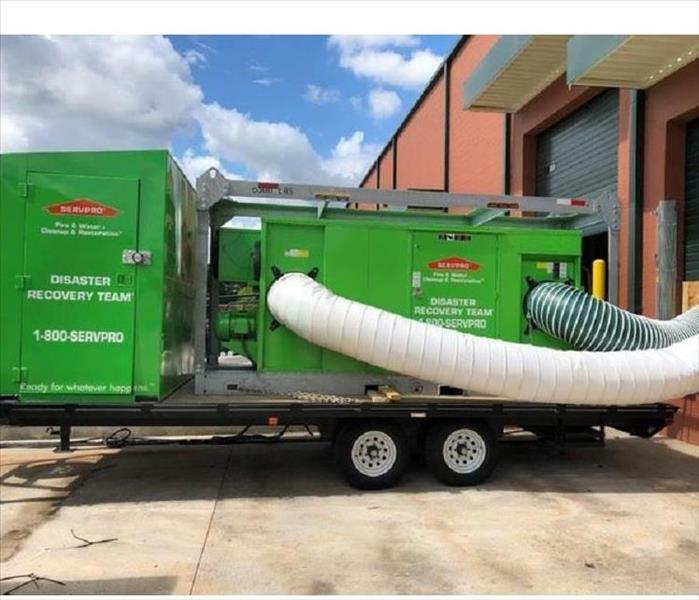 When this facility in Buford suffered damage from a large loss, we brought in the desiccant dehumidifiers you see pictured here because it is critical to deal with moisture as quickly as possible to prevent secondary damage, such as mold. When you have a large water loss in your commercial facility, we bring in the heavy equipment. 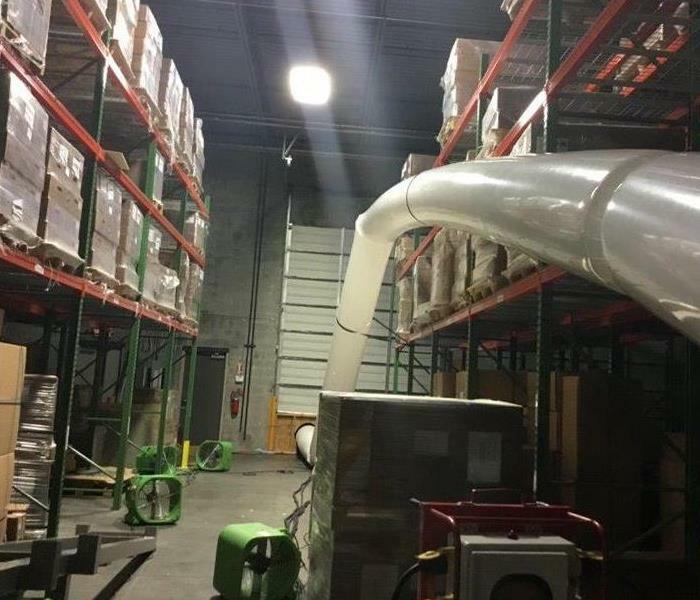 Here you can see ducting used with a desiccant dehumidifier. If you have a water loss in your business, give us a call! 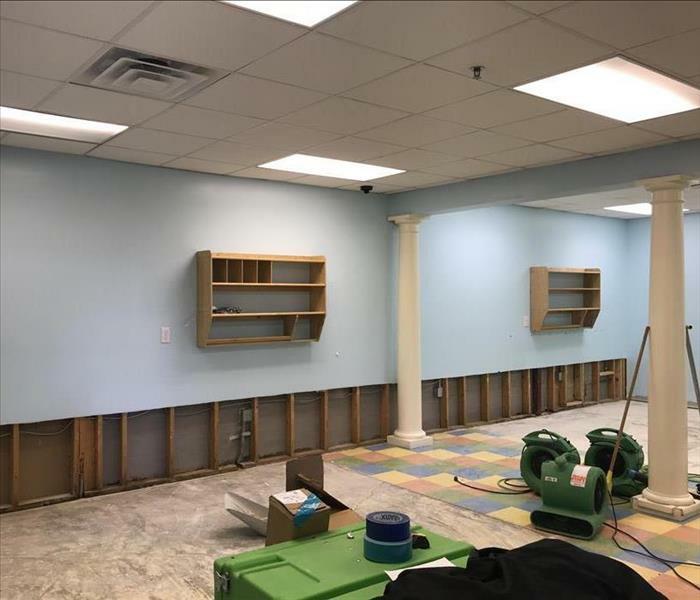 This business in Suwanee experienced a large water loss that left it flooded and damaged. Our team was on site quickly and were able to extract the standing water and get the facility dried out in a short time. 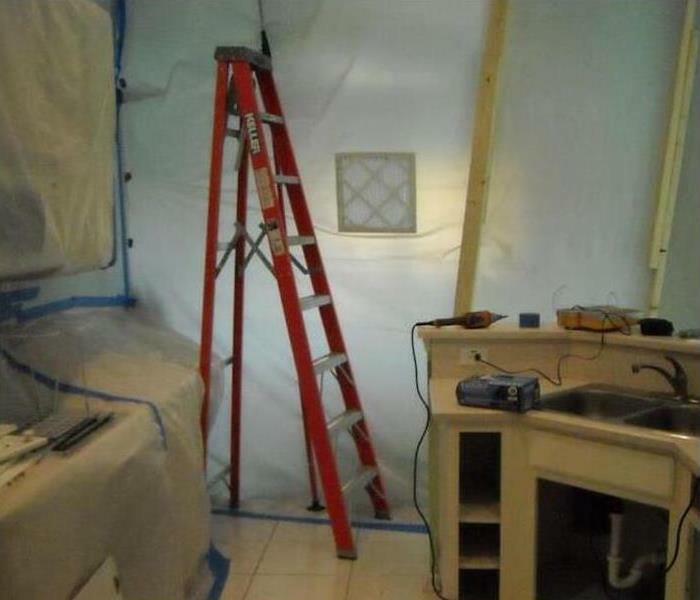 When our team is called to your home or business to deal with moisture and mold, one of the first things we will often do is set up a containment barrier to prevent uncontaminated portions of the structure protected. When your business suffers a water loss, you want to keep downtime to a minimum. Call SERVPRO. We are ready for whatever happens and will do everything we can to get you back up and running quickly. 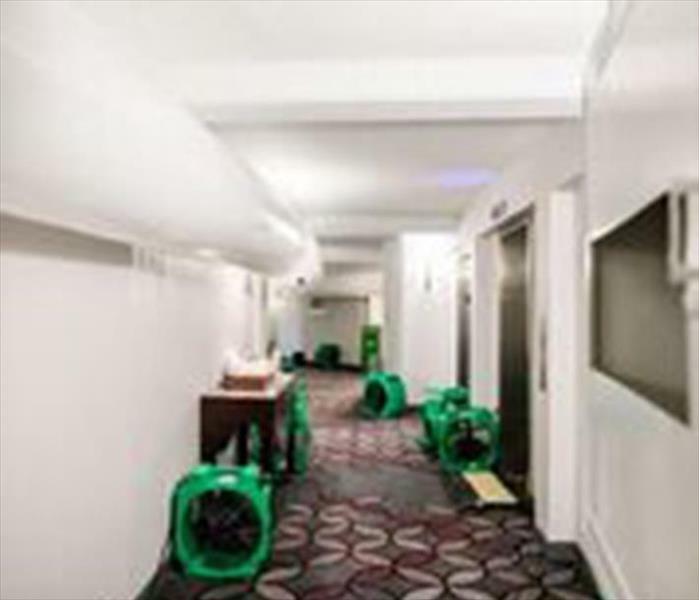 For water loss cleanup, we often use smaller dehumidifiers along with air movers and air scrubbers to help pull moisture out of the air. For larger jobs like this, we sometimes have to bring in larger equipment like this desiccant dehumdifier. 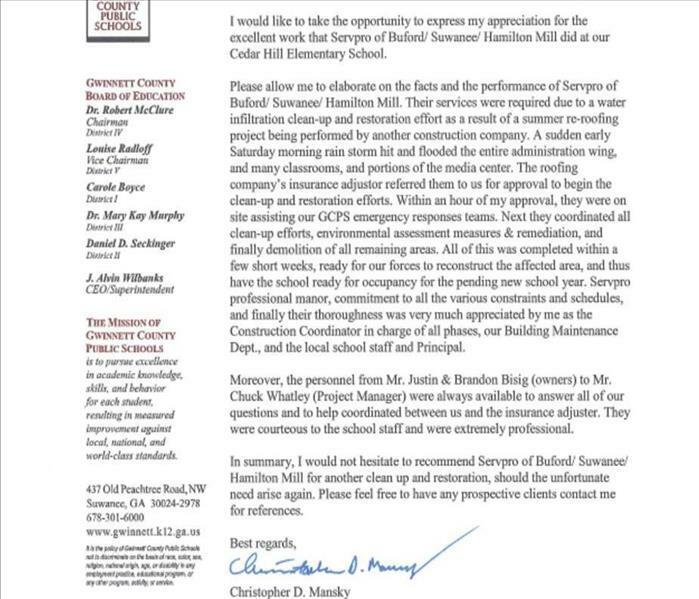 This facility in Suwanee suffered a large water loss and our team was called in to handle the cleanup and repair. If your business suffers a loss like this, give us a call. We are faster to any size disaster. 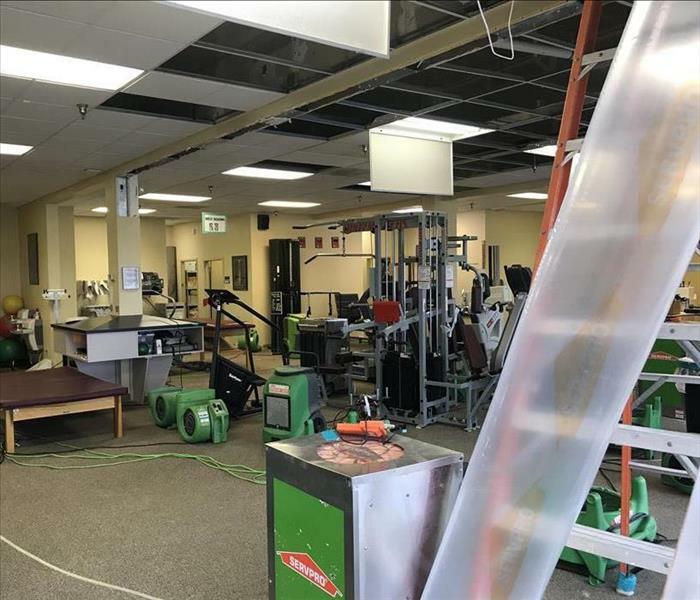 When the gym in this image suffered a large water loss, the crew of SERVPRO of Buford/Suwanee/Hamilton Mill was quick to respond to the call to help with the cleanup and repair of the facility. A Suwanee business needed to have their walls cut because of the damage done by flooding. Flood cuts are typical when it comes to flood water. It may seem that it is more damaging to the building but insurance companies require it after black water intrusion. This facility suffered a water loss and our team responded to perform the cleanup. In this image you can see that we have brought in equipment and placed it so that we can dry up the water. Our team is ready any time day or night to respond to your disaster. So, if your business suffers a loss of any kind and you need a quick response. Call us. We are faster to any size disaster. In this image, you can see that we have put containment barriers in place in this commercial facility in Buford while we are working to restore it. If you have a commercial loss, give us a call. 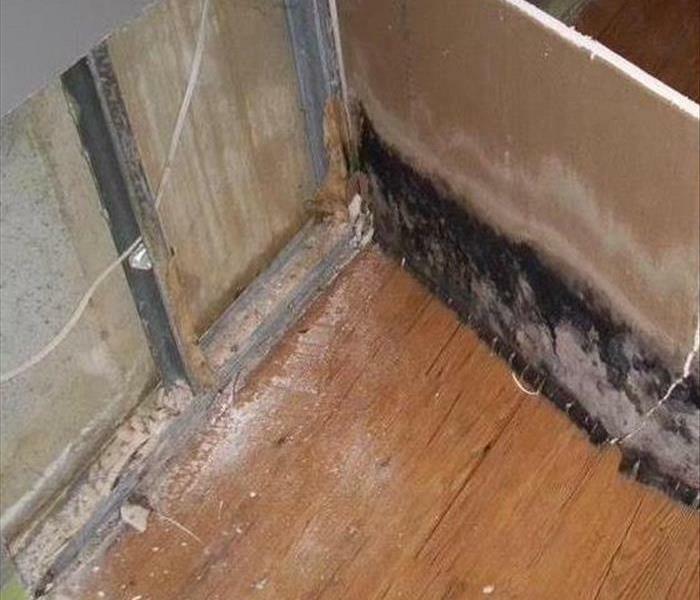 This home had a large water loss that eventually led to the mold you see in the picture. We first brought in drying equipment to remove the moisture, then we began the demolition and restoration of this home. 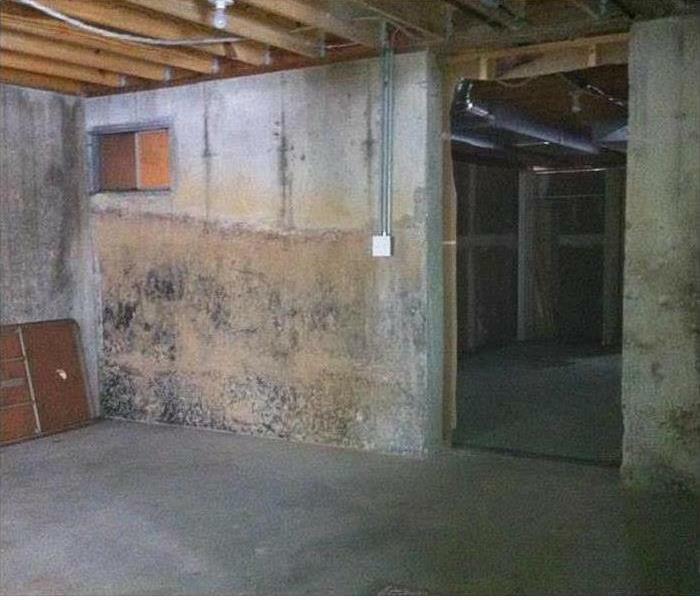 A water loss in this home left it damaged and flooded, as you can see in this image. 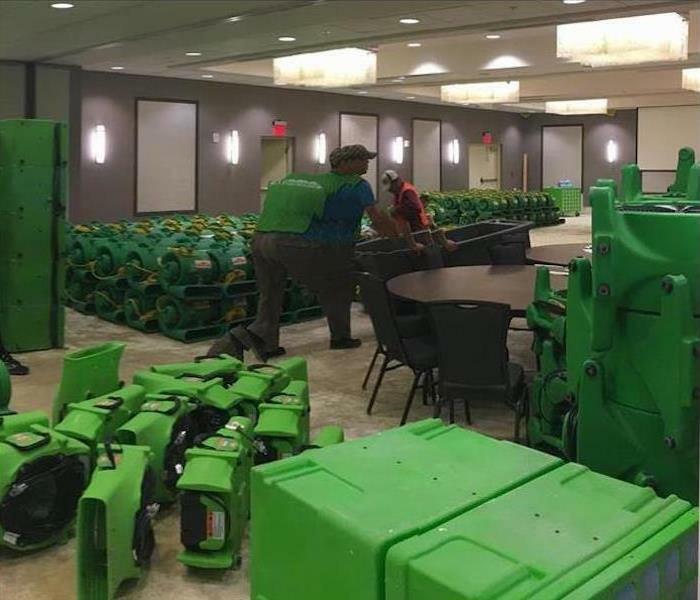 Our team brought in drying equipment to remove the excess water and then began repairing the damage. This room was damaged by water from storms that impacted the area recently. 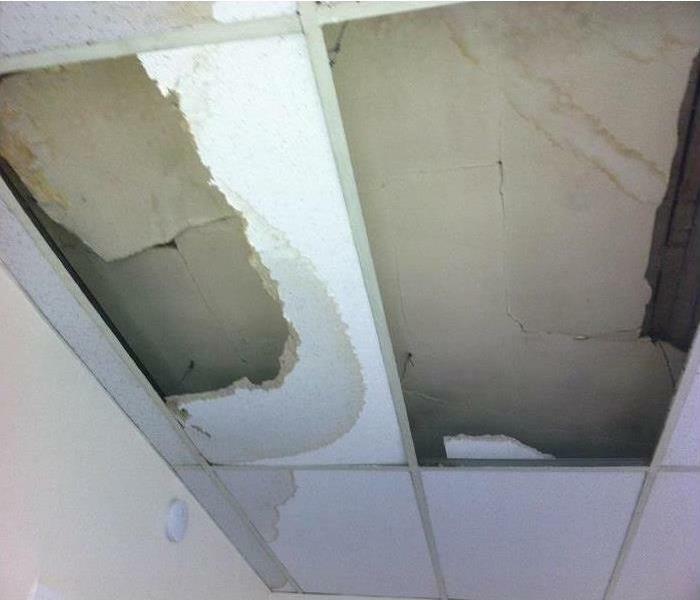 The heavy rains caused a water intrusion that did the damage you see here. If your home is damaged by storms, give us a call! This sun room suffered damage from wind and rain from heavy storms that rolled through the area. Our team responded and got to work cleaning up and restoring the damage. When we were done, it was "Like it never even happened." In this photo, you can see some of the equipment we use, including air scrubbers and fans, staged and ready to move to a large mold job. We are always prepared with proper equipment for any job. When a severe fire happens, the results can be devastating. Stress and emotions can run high and you just need a resolution. Our emergency response team is ready to respond and help mitigate the damage, and your stress levels. 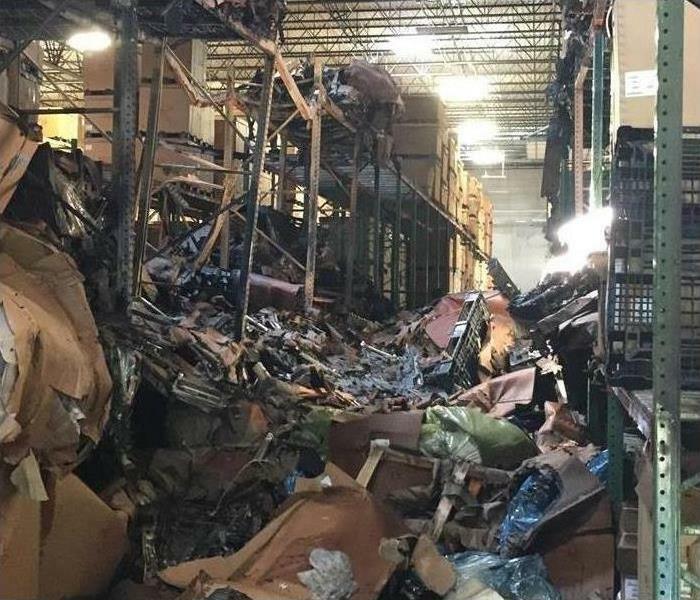 This facility suffered a large fire loss. Here you can see our team in action working hard to clean up the damage and restore the facility. If you have a fire loss and need a fast response, we are always ready for whatever happens. 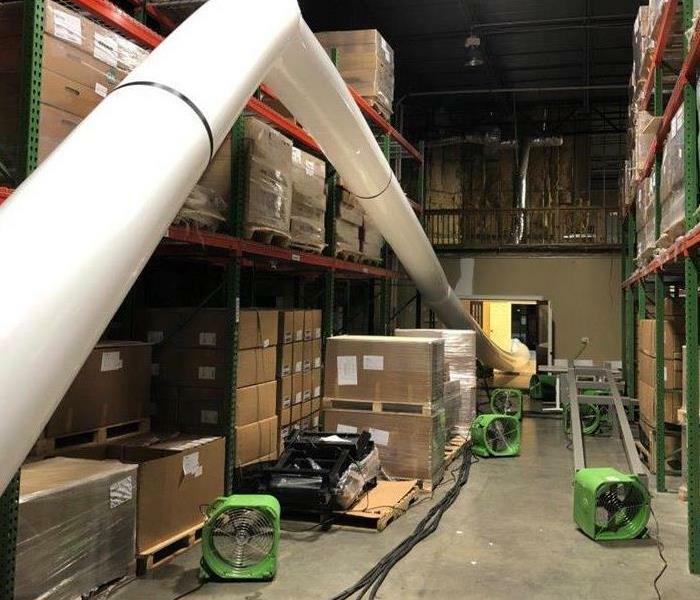 In this photo, you can see ducting that has been put in place during the drying process after a water loss in this commercial facility in Buford. If you experience a commercial loss, give us a call. 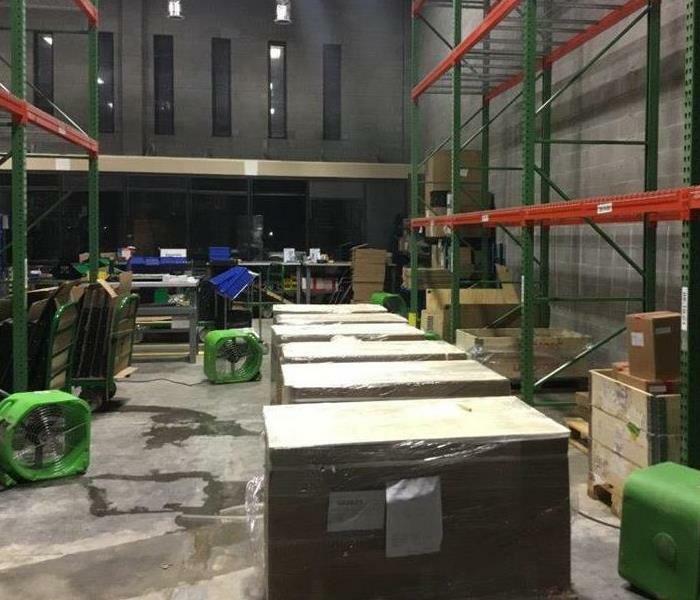 In this picture, you can see we put drying equipment in place and are in the process of repairing damage that was caused due to a water loss in this commercial facility. If you have a water loss, give us a call! The crumbling and stained drywall panel, opened up for removal, shows the black mold growing. This section was disposed of according to regulations, and then cleanup and disinfecting steps occurred. Our SERVPRO techs can then re-close the treated area. 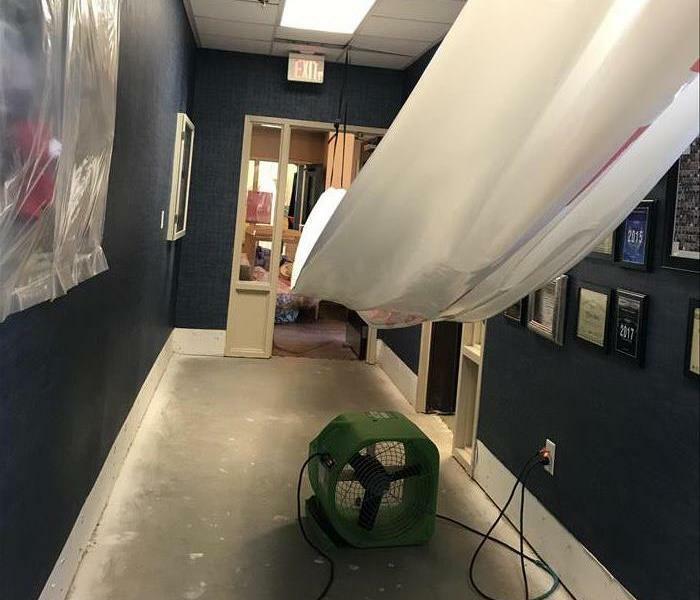 Water seeped through the flat roof and damaged the vapor barrier and the drop-ceiling tiles of this office in Sugar Hill. 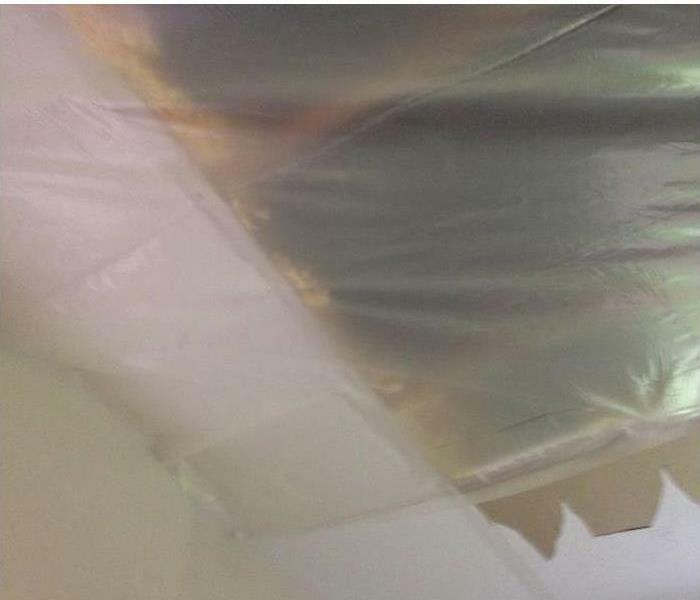 Placing a tarp over the access point and then removing the non-salvageable items is the first action for water damage restoration and repair to this structure. 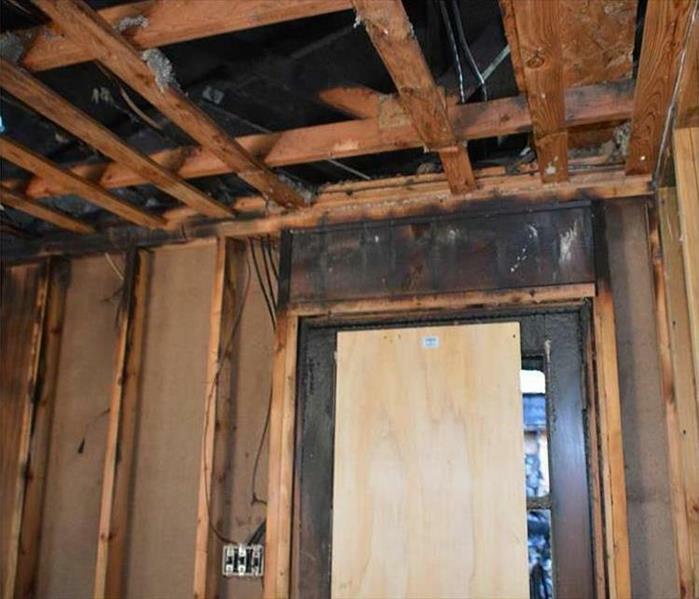 Significant fire damage restoration covers several different steps. Cleanup to secure a safe working space is crucial to technicians safety. Then the demolition can start on the charred elements. Board up also helps to safeguard the interior of the structure. The windswept storm water that penetrated the attic of a house in Suwanee resulted in a collapsed ceiling. Isolating the house from the damaged area is a safety feature but has another positive effect. Decreasing the volume of air in the attic means that the dehumidification and storm damage restoration process will be more rapid. Large and tall commercial buildings in Buford require special truck and trailer mounted equipment. 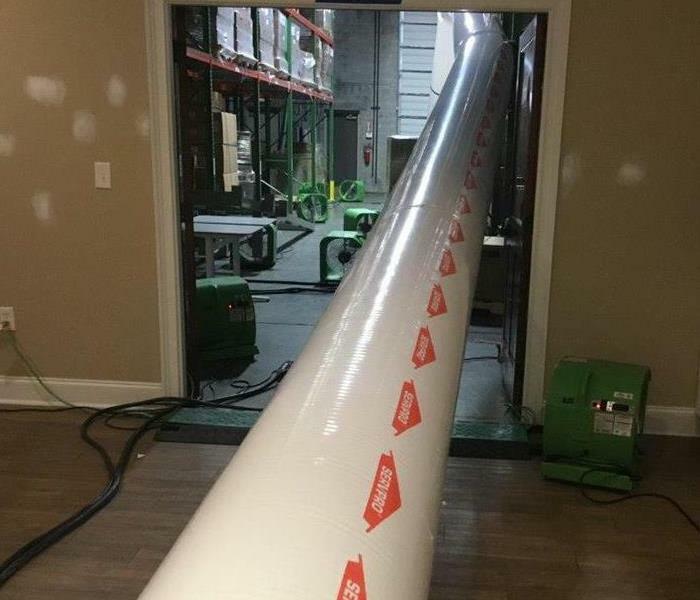 The long tubes extracting the remaining moisture are used by professional companies like SERVPRO of Buford / Suwanee / Hamilton Mill. 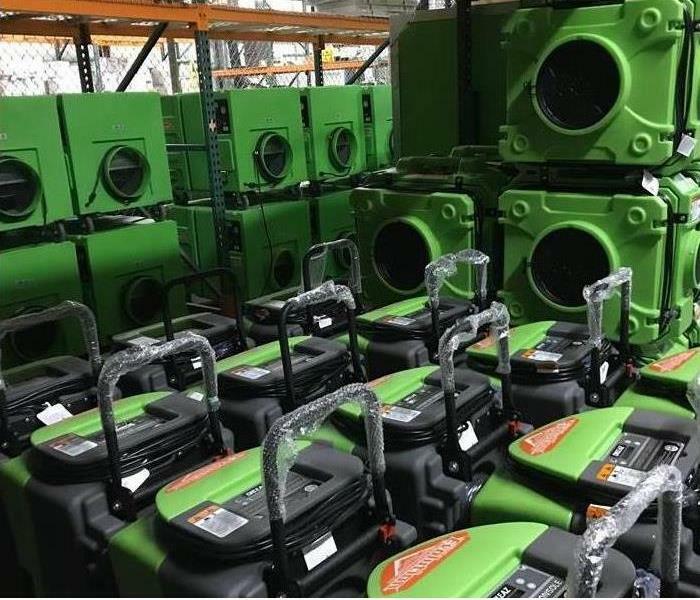 The training and skill set of technicians are critical in implementing the successful use of these giant desiccant dehumidifiers being powered by diesel generators. 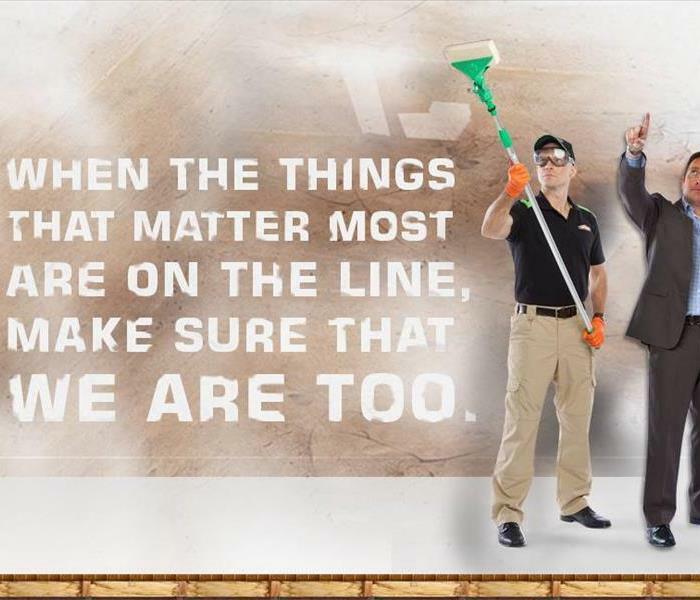 For a job done with precision and expediency call SERVPRO for assistance. Commercial equipment for water and storm damage is an integral part of our Disaster Response Teams. A great quantity of equipment needs to be available on a moments notice. As you can see, the inventory of equipment is substantial and ready to roll on an emergency basis. Mold damage cleanup at this Suwanee home began with SERVPRO constructing a containment area to stop mold spores from moving throughout the house during mold damage cleanup. The photo shows the completed containment area. 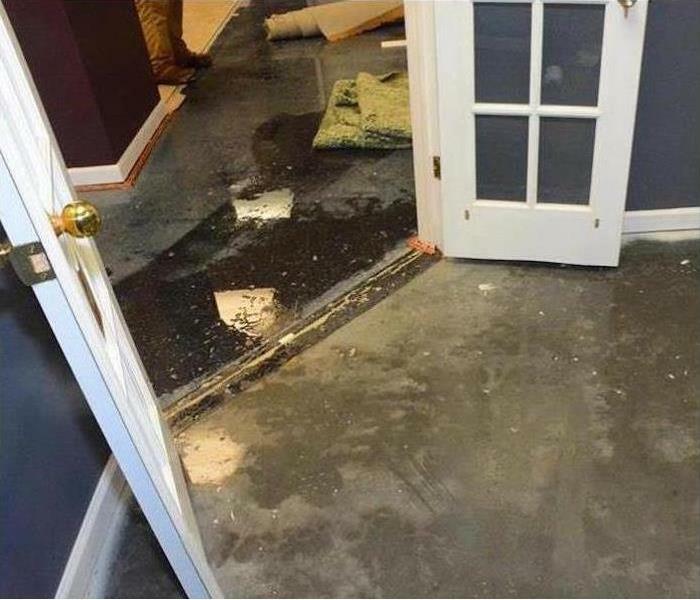 The water from the rain storm deposited about an inch of water throughout this area of the home. We immediately planned to lift the furnishing above the standing water and begin the extraction. The water supply line to this washing machine ruptured and flooded the now uncarpeted hallway. 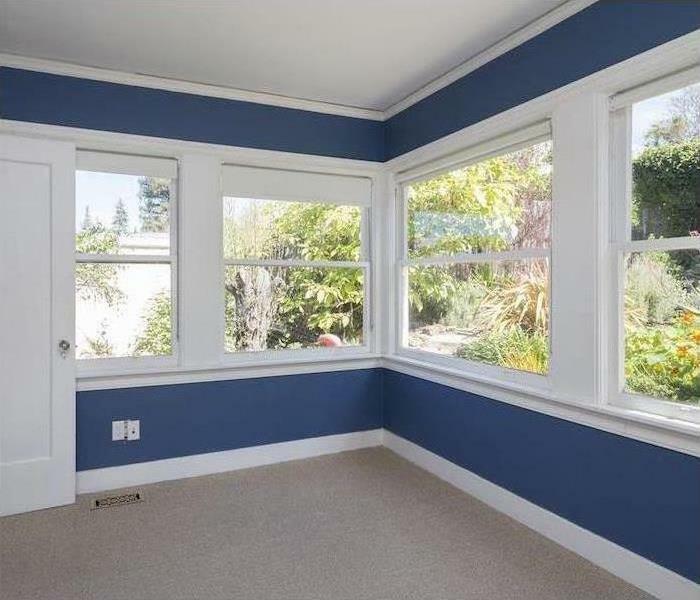 We quickly removed it to preserve the wood baseboards, doors, and drywall. 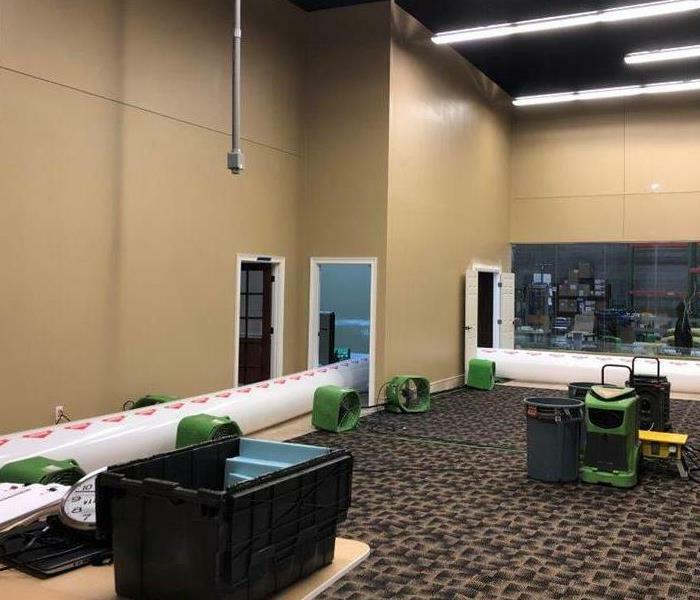 We are now ready to set up several dehumidifiers and partition the corridor to maximize the evaporation rate and capture of the airborne vapor. 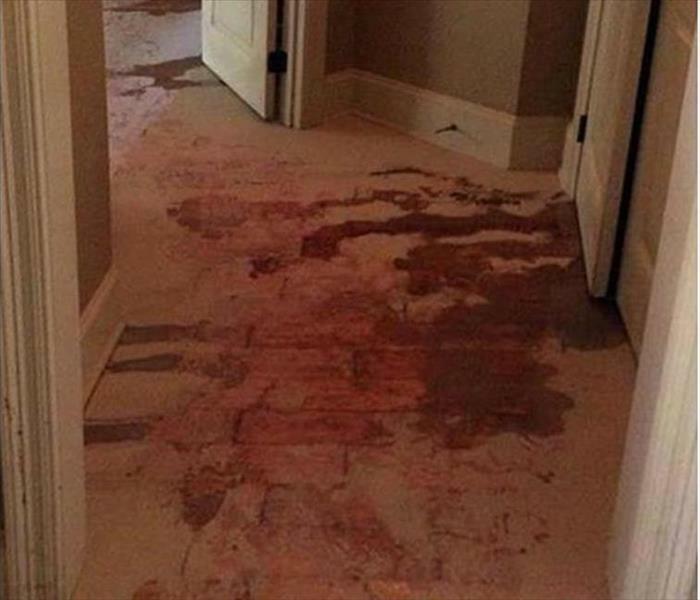 Fast service prevented secondary water damage to this Buford home. 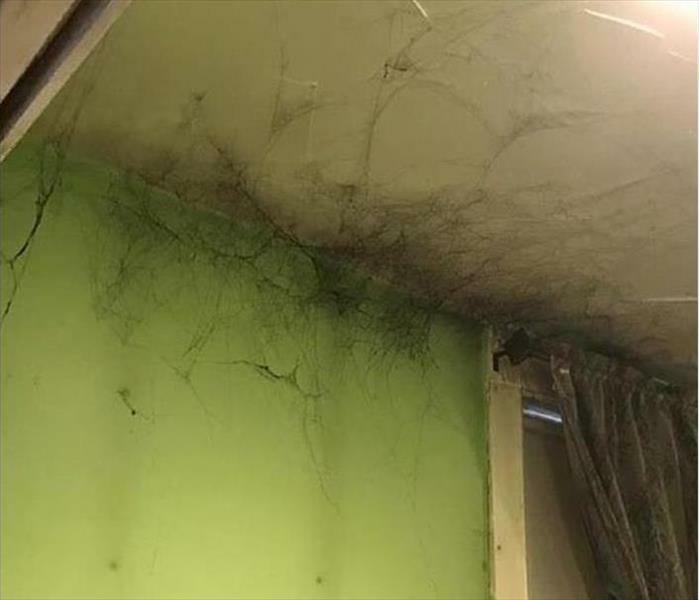 The cold weather, along with the oily soot from the kitchen fire, circulated into the living room area to create these "artistic 'Cobwebs.'" We vacuumed up this fire-damaging residue, wiped down the walls and ceilings with the correct cleaning product with dry sponges, and set up an hydroxyl generator to dispatch the airborne smoke particulates and odors. 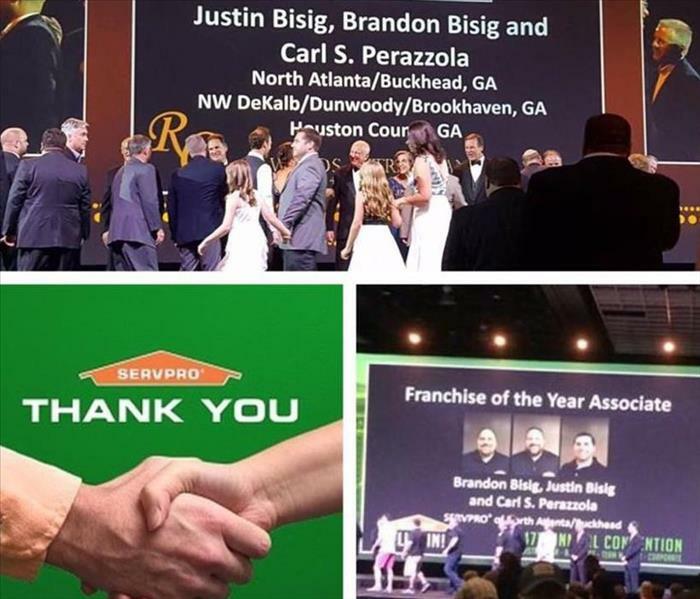 We are proud to be the winners of the 2015 SERVPRO Franchise of the Year for Georgia. Our customers are the main reason we are able to achieve this honor. If you have a loss in your home or business, we will be honored to serve you too! We are proud to be independently owned and operated. Being an independently owned company means that we have a vested interest in making sure that when you need help, we make it "Like it never even happened." Whether you experience a loss due to fire, storm, water, mold, or anything else, we are always here to help. Our team is available for an emergency response any time day or night. We are faster to any size disaster. 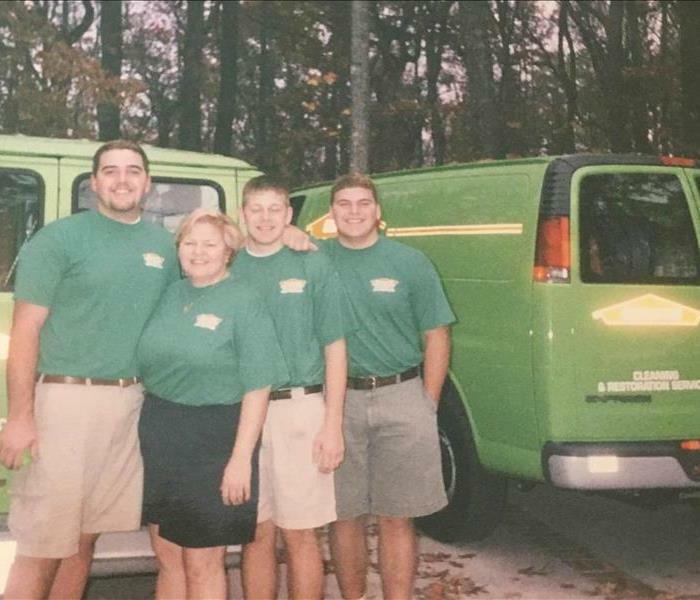 We are proud to be a family owned business. We feel like our customers are family too. So if you experience a loss, we will be there for you. No matter what, we are faster to any size disaster. We Love our Team! One of the best things about this business is being able to build relationships. Not just with each other, but with the customers we serve as well. If you need us, we'll be there. We are proud to be members of the Atlanta Apartment Association. We agree with and perform within the standards and practices that this association holds to. We are always ready to serve, any time we are called upon. 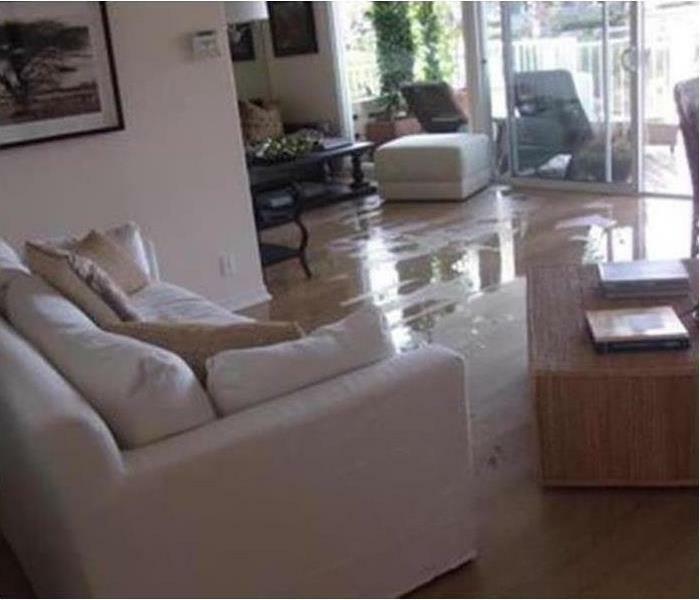 When a water loss occurs, it can cause flooding like this in your home or business very quickly. If this happens to you, give us a call. Our team is always ready to make it "Like it never even happened." 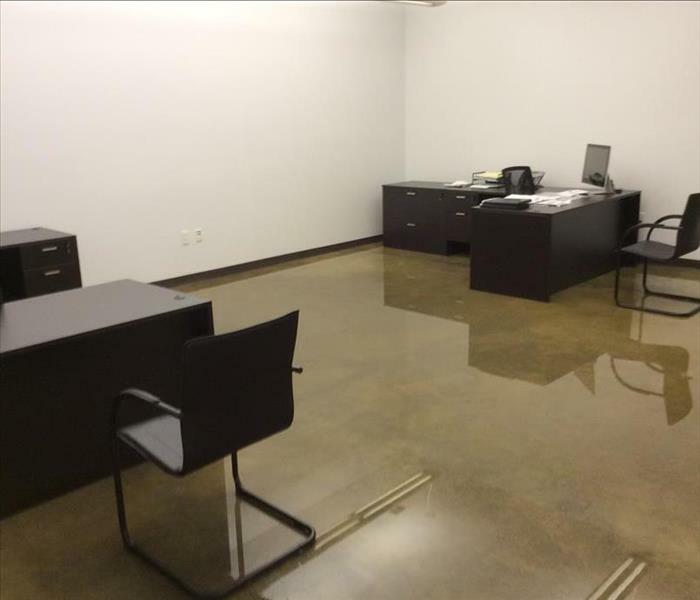 This picture shows an office in Suwanee which has suffered a heavy water loss, resulting in the flooded area you see here. It doesn't take long for this kind of flooding to happen. If it happens to you, give us a call! SERVPRO's 47th Annual Convention at the MGM Grand in Las Vegas we were humbled to be awarded Franchise of the Year out of over 1,700 locations. 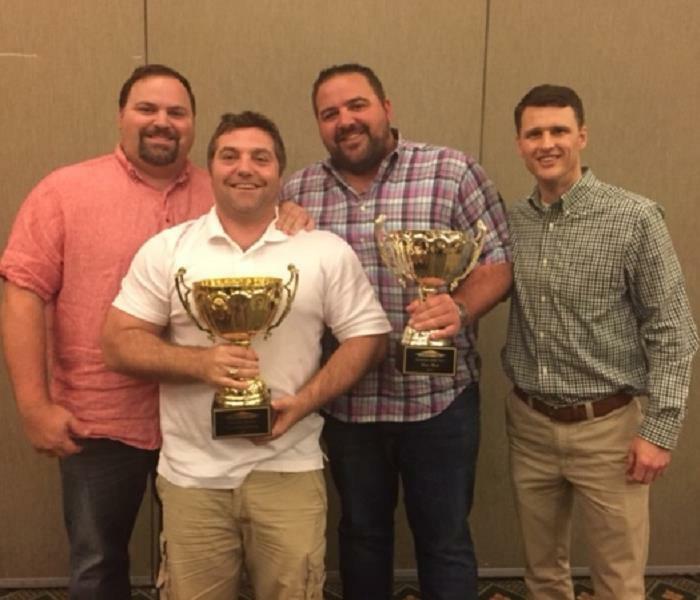 This award is in recognition of an all-around top Franchise for loyalty, attitude and growth within the SERVPRO System. As you can see this was awarded to "Team Bisig"! We could not do what we do without all the hardworking people on our ...team! These team members routinely spend countless hours away from their family working in rough conditions to help our customers in their time of need!